The Library has a rare copy of an engraving of Rabbi Enoch Zundel, the first published American engraving of a contemporary Jew. 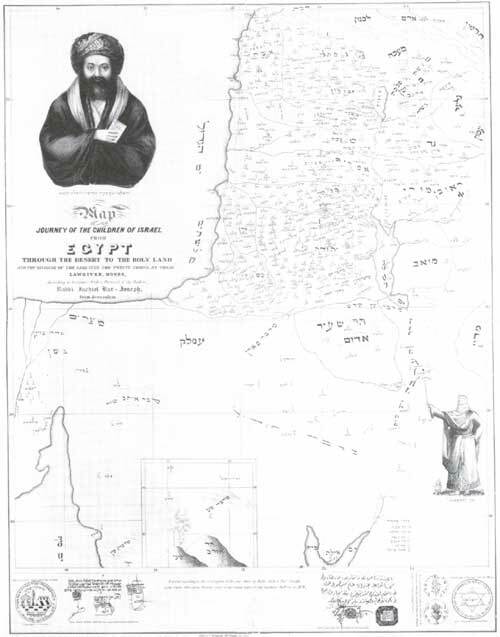 Rarer still is a map of the Holy Land published in New York seven years later, in 1840, by another Jerusalem emissary, Jachiel Bar-Joseph, Map of the Journey of the Children of Israel from Egypt Through the Desert to the Holy Land and the Dividing of the Same into Twelve Tribes, by their Lawgiver, Moses. Lithographed by G. Endicott, 152 Fulton Street, New York, the map is all in Hebrew and shows the Holy Land dotted with cities, towns, and tiny historical vignettes. At the banks of the Jordan are the twelve stones placed there by the Children of Israel; above it is the altar erected by Joshua; and the tomb of Rachel is marked by a black monument. Cities are symbolized by buildings which identify them as royal, large, small, or city of refuge. The cartouche in the upper left-hand corner depicts a turbaned Rabbi Bar-Joseph, a tallit draped around his shoulder, holding a copy of Hok L'Yisrael, a biblical commentary beloved by the Sefardi Jews. At the lower right-hand side, Moses stands, rays of light shining from his head, his staff lifted toward the wanderers in the desert, with the biblical verse, "Turn ye northward" (Deuteronomy, 2:3). Map of the journey of the Children of Israel from Egypt through the Desert to the Holy Land and the Dividing of the Same into Twelve Tribes, by their Lawgiver Moses, according to scriptures with a portrait of the author. Rabbi Jachiel Bar-Joseph, from Jerusalem. The map, lithographed by G. Endicott, 152 Fulton Street, New York, may well have come to the Library as a copyright deposit, entered by the "author," an emissary from the Holy Land at the clerk's office of the District Court of the United States for the Southern District of New York. Jachiel Bar-Joseph, Map of the Journey of the Children of Israel. . ., New York, 1840. Geography and Map Division. The illustrations below the map give it special importance and impact. Beginning on the left, the seal of the Ashkenazi community of Jerusalem depicts the Wailing Wall and the mosques of Omar and Al-Aqsa, with the biblical verses, "Zion shall be redeemed through justice and those that return by righteousness" (Isaiah, 1:27) and "If I forget thee, O Jerusalem" (Psalm 137:8). An English description reads: "This seal is the impression of the German Sinagogue [sic] in Jerusalem." To the right, in Sefardi Hebrew script, is a receipt for payment of a debt, written in Alexandria, Egypt, in 1831, and signed in the customary florid style by three Sefardi rabbis, and Bar-Joseph's printed description reads: "Rabbi Jonoth Neron and his two associates recommendations." It is of course no such thing. BarJoseph had the document with him and used it for his own purposes, certain that no one would ever examine its contents. Further to the right is a document in Arabic dated 1833, extending protection to three Austrian Jewish pilgrims, and described as "Certificate from the Basham of Jerusalem." At furthest right are displayed two sides of a shekel coin, on one side imprinted "shekel of Israel," on the other "Of the holy Jerusalem," and to its right, "Impression of the Seal from the Portuguese Sinagogue [sic] in Jerusalem," a Star of David with the quotation from Isaiah, 1:27 repeated. We may surmise that Bar-Joseph was not one of those many pious and selfless emissaries who travelled the world to seek aid for their impoverished Holy Land communities. Very likely, he represented only himself, and his reputation may have preceded him, for the Shearith Israel Congregation of New York refused him help on November 3, 1839, but on July 23, 1840, allotted him twenty dollars to assure his departure to Europe. The poor of Jerusalem may not have benefitted from Bar-Joseph's stay in New York, but the Library of Congress did. It now holds one of the rarest items of Holy Land cartography, perhaps a unique copy, which came to it, as the map indicates, as a copyright deposit. Entered according to Act of Congress in the year 1840 by Rabbi Jachiel Bar-Joseph in the Clerk's Office of the District Court of the United States for the Southern District of New York. Jacob Schumacher, "citizen of the U.S. of N.A." (as he describes himself) and a Christian religious enthusiast, settled in the Holy Land, and produced this Plan of the German American Colony near Haifa, for the Templers, an adventist religious group which established four settlements of adherents in the Holy Land to await the imminent second coming of the Messiah. Note the ships Uncle Sam and New York flying the American flag. 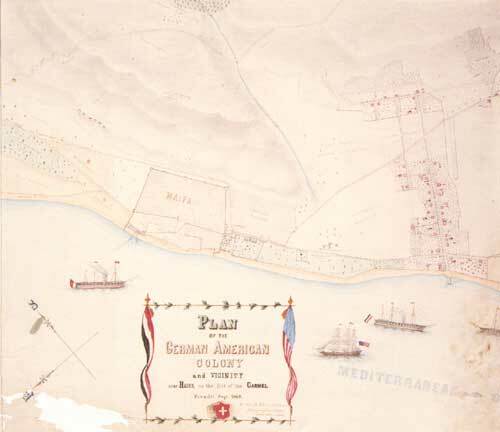 Jacob Schumacher, Plan of the German American Colony near Haifa, 1873. Geography and Map Division. In the vault of the Library's Geography and Map Division is a unique map of a section of the Holy Land, an illuminated manuscript map, Plan of the German American Colony near Haifa, "surveyed and drawn by Jacob Schumacher citizen of the U.S. of N.A." In ink and watercolor, the map measures 74 by 105 cm. and is inscribed to the "Hon. Sh. Schurz, Senator." The reference is to Carl Schurz, Senator from Missouri, the first German American to enter the U.S. Senate. Jacob Schumacher, a resident of Zanesville, Ohio, was the first American "Tempelgesellschaft" (The Temple Society) adherent to settle in Palestine, arriving there in 1869, for the founding of its colony in Haifa. The Templers, a Lutheran pietistic, evangelical adventist group anticipating the imminent second coming of Jesus, established four colonies in the Holy Land during the nineteenth century to await his arrival. Schumacher, serving as the architect of the Haifa settlement, was elected its head. The group had difficulty in getting residence rights from the Turkish government, and we may surmise that the Plan for a German American colony was sent to Senator Schurz, to solicit political support. To underscore the American nature of the enterprise, Schumacher drew two ships flying American flags off the Palestine coast, the Uncle Sam and the New York. He may well have been helped in the preparation of the plan and the drawing of the map by his sixteen-year-old son, Gottlieb, who later became a leading explorer, cartographer, architect, and archaeologist of the Holy Land.